Grantee, Jennifer Morgan, works for the Genesis Farm Learning Center in Blairstown and is writing a story about the universe, in the universe’s own voice, starting from the beginning and continuing up to the present day. 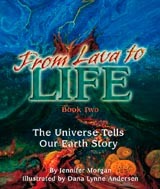 Book Two in the trilogy, “From Lava to Life: The Universe Tells Our Earth Story”, was released in February 2003. The books are available from the publisher at http://www.dawnpub.com. 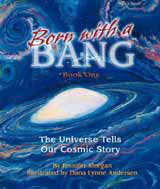 Book One, “Born with a Bang: The Universe Tells Our Cosmic Story,” arrived in stores in the spring of 2002. The book won the Teachers Choice Award for 2003, chosen by 80 teams of teachers nationwide who tested out books in their classrooms. The Award was announced in the January 2003 issue of Learning Magazine (150,000 subscribers). To read the press release for this book scroll down or click here. (3) The Age of Mammals and Beyond. Recent discoveries about the beginning and evolution of the universe are grippingly told in a pioneering way in this new book. In Born with a Bang: The Universe Tells Our Cosmic Story, the Universe tells the tumultuous 13-billion year story in a way that both children and adults feel their intimate participation in the story. This “first person science” or “science from the inside” draws the reader into a personal experience that “engages the heart and transports the reader into the realm of imagination,” according to author/storyteller Jennifer Morgan. This story is not only about learning science. It’s also about chaos and creativity. Nearly perishing, time after time, the Universe bravely transforms itself into new forms. A heroic journey of struggle and triumph, it’s the journey that we all share. From the big bang to the battle between particles and anti-particles to the formation of hydrogen atoms to the mother star ripping herself apart and her dust forming into the solar system, readers learn the most recent science on these subjects while hearing the most riveting story there is – the story of the Universe. Although astrophysics and evolutionary biology are undergoing a dramatic renaissance of discovery, many of these discoveries are not included in science textbooks. Born With a Bang makes these astounding discoveries accessible to teachers, parents, and children. Written in a voice for children but for all ages, Born with a Bang is endorsed by Edgar Mitchell, the sixth man to walk on the moon; Neil deGrasse Tyson, director of the Hayden Planetarium; Leon Lederman, Nobel prize winner in physics; Thomas Berry, cultural historian; Brian Swimme, mathematical cosmologist; Swami Agnivesh, a renowned Indian swami; and numerous others (see attachment). Although the target age range for this book is ages 8 through 12, the actual age range is far broader. Author Jennifer Morgan, of Princeton, New Jersey, is a storyteller and student of cosmology. Illustrator Dana Lynne Andersen, of Santa Rosa, California, is a noted artist and also a student of cosmology. The illustrations aptly convey the power of the story. Dana Lynne Andersen, M.A., is a multi-media artist, playwright and teacher with degrees in philosophy and consciousness studies. Her paintings explore the swirling forces of energy that underlie matter. She is founder of Awakening Arts, a network of artists who “affirm the noble purpose of art as a vehicle for uplifting the human spirit.” Andersen hopes that the artistic style of Born with a Bang will inspire artists to build upon the discoveries of science to develop inspirational art forms that connect us to a larger sense of self. This book is the first of a trilogy telling the story of the Universe from the beginning of time to the present. Supported by a grant from The Infinity Foundation, Born with a Bang begins with the Big Bang and ends when Earth is formed. The second in the trilogy will take up the story as life appears on Earth, and conclude with the dinosaur era. The third will cover the era of mammals to the present time. Dawn Publications specializes in nature awareness books for children. A narrative telling of the story. Captivating illustrations that blend the science and mythology in the story. A possible time line on the bottom of the page. Sidebar that covers activities for parents and teachers. This could also be in an appendix in the back of the book. Swimme, Brian and Thomas Berry. The Universe Story: From the Primoridial Flaring Forth to the Ecozoic Era, A Celebration of the Unfolding of the Cosmos. Harper Collins Publishers, New York, 1992. Couper, Heather and Nigel Henbest, Big Bang: The Story of the Universe. Illustrated by Luciano Corbella. A DK Publishing Book, New York, 1997. O’Murchu, Diarmuid. Quantum Theology: Spiritual Implications of the New Physics. A Crossroad Book, The Crossroad Publishing Company, New York, 1997. Fabian, A.C., Evolution: Society, Science and the Universe. Press Syndicate of the University of Cambridge, Cambridge, United Kingdom, 1998. Burton, Virginia Lee. Life Story: The Story of Life on Our Earth from its Beginning up to Now. Houghton Mifflin and Company, 1962. Jennifer Morgan is deeply steeped in the new cosmology as articulated by Thomas Berry and Brian Swimme. She has been a student and teacher at the Genesis Farm Learning Center for over two years. Her teaching style is highly engaging and her story telling has a deeply powerful impact on listeners. (See comments about her telling of the universe story.) Ms. Morgan plans to expand upon her teaching and story telling, particularly after publication of the book, into programs at schools, Earth Literacy centers, and colleges. Already several hundred people in the Genesis Farm Earth Literacy Program and at other locations, have heard her telling of the universe story. Many are representative of other earth literacy centers in the United States and other countries. A large number of teachers who have heard the story are looking for literature to use in their classrooms, and have expressed a strong interest in purchasing the book once it is published. Ms. Morgan has considerable experience in public relations. She was director of the Northeast Organic Farming Association of New Jersey for seven years. In that capacity, she gave countless speeches and worked with the all forms of media — newspapers, magazines, television, and radio. Every year, she organized an Organic Country Fair that drew well over 7,000 people in 1994. Ms. Morgan’s experience in publishing extends back to her earliest memories with her family’s publishing company, Morgan & Morgan, Publishers of Fine Photographic Literature. Her grandmother, Barbara Morgan, published a number of photography books, most notably on Martha Graham, the modern dancer. When Jennifer Morgan was in her early 20s, she worked in the family publishing business, where she learned about editing and marketing books. She managed a commissioned sales force, represented the company at numerous book conventions, and handled media relations. She learned the entire process of taking a book from manuscript, to published book, to promotion. Not only does Ms. Morgan feel extremely comfortable giving talks, she enjoys public relations. She deeply believes that a widespread understanding of the story will help bring about a more intimate and caring way for humans to interact with the Earth. She is a highly promotable author and looks forward to speaking tours, book signings, etc. Furthermore, she has the ability to organize, in partnership with the publisher, a media campaign. She can also organize a promotion campaign independently, where necessary. I really liked the introduction where it talked about us being a speck inside our mothers. I liked how the story described the universe becoming different things, how you had all the facts comparing them to other things. It’ll be a big hit with kids because they’ll have fun learning about the universe. I like the idea of the universe being born. The story is very interesting. I think it’s neat that the universe tells the story. It’s the only story I know about where the universe tells the story. It’s a different point of view than most people think about. The story makes you realize that even though you can’t remember the beginning of the universe, we were really there and we’re related to all other people of the past. I like to think that when I’m sad the universe is experiencing sadness with me. Then I know I’m not alone. I like the way you put words and things together. I like the idea of particles and anti-particles fighting. I like that the universe would do that. The universe is in everything from little things to large things. I like the violence and chaos in the story. It’s neat the way the Mother Star knitted together calcium and that that’s related to people. I like the way the story says that love was there from the beginning. I agree with that because matter was formed when the universe was really young. If love was going to come into existence it must have come into existence in the beginning. I know people didn’t invent love. It’s not something that people could invent. I never heard a story like this before. It was very interesting. I never knew how the universe started before. It’s cool that the universe is telling the story. I found out that we are part of the universe. In the beginning we were a different property of matter. The book urges you to get to the next page because you want to understand more. I like the part about being vaporized because it’s exciting. I like the story because I like to learn about the history of the universe. I liked learning about how particles became matter, about how tiny bits of matter are our ancestors. I liked hearing about particles and how they destroyed each other. I didn’t know that there was a time when the universe was just energy. Kids like stories about the universe and space. I like that the story has a lot of action. I liked the story about how the world started. I like the way the Mother Star knits together calcium. It’s very good. I never read a book like this before. Sometimes I don’t like science because you don’t get that the universe is alive, but it really is. This book shows that we humans were part of the universe long before we could process that thought. We were being made part of something bigger than just the world. We’re in an evolving process. I like it. It’s cool. I like the way the book gives a sense of how everything was once a speck of dust. I like the way the early particles are ancestors of magnificent galaxies, humans and mice. We all came from the same universe. I like the way the universe has a mind of its own — it’s amazed and scared. I like the mixture of science and myth. If a story is all science, it’s boring. If a story is all myth, it’s boring. I like the part about the Sun loving its planets. Usually we don’t think of the Sun as a being. We take it for granted. But if the Sun loves its planets, it must be alive. The story is interesting. No one’s told the story from the point of view of the universe. I like the way it says you are part of me too. It makes you think. I like the way you use random animals, like saying black holes to bobcats. I could see this story being told in the older grades, also adults, and middle school. It’s cute the way the universe was proud of creating hydrogen. I like the way the young galaxy is like a teenager. I like the way the universe creates different things out of itself, then destroys itself. I like the way the children of the Mother Star carry on the story. I like the way the Sun as father loves its planet. I like the whole love topic. I like the way the universe learns its own lessons and stored its memories. The story held my interest throughout. The story shows that if you think before you make something, you can make something really good. I like that we were there in a tiny speck from the beginning. I like the way the universe is amazed and gets emotional. I like the way the universe experiences itself first-hand. I like the way you the story talks about protons and electrons and mixes science with feelings. I grew up thinking science was dead. But this story excites me about science because it gives the universe a subjectivity. The story shows that the universe has a story which is even more exciting than hearing scientists tell us the story about the universe. In an age of billboards, neon signs, TV, and video games, the creative mind has little chance to survive the constant 20th century onslaught. Jennifer Morgan’s Universe Story gives children a sense of origin and connection to the universe, potent medicine for our ailing society. When kids get the impact of the story of the universe, it is a deeply revelatory experience for them. I see a sense of divine magic awakened in children, as they listen to the story of our creation. It’s as if the creativity of the universe itself is acting through the children. I like the presentation of the universe as conscious and constantly experimenting. The flow of the story is good for children’s comprehension. You paint a wonderful picture — your descriptions are full of the power and wonder that certainly is part of our creation. I liked the way you talk to the child and keep bringing the story back to the child so he/she doesn’t get lost with all the big words and ideas. I like the way the story is straight and clear and doesn’t talk down to the children. I feel very enthusiastic about this story because it is in keeping with the cosmic education thrust of the Montessori philosophy. It teaches the interdependency of all life, that humans have a role in the universe, and that each human has a responsibility toward the community and the natural world. We each make a difference. This story is a love letter meant to provoke the reader. It shows that you don’t have to have the Bible on one side and the Theory of Relativity on the other. The story breaks down the barriers between science and spirituality. Both are ways of seeking truth and love. The book shows that all physical being is resting on huge pyramid of support and all things are supporting each other. Great concept and I like the writing. It’s ambitious and creative at the same time. Kids can become familiar with science in a fun way. I enjoyed the lyricism in this story and the sense of urgency in understanding the basics of creation.